Right now, the Bears are starting the new calendar year off by playing their last game of the season, against their divisional rivals, the Minnesota Vikings. As disappointing as the Vikings have been after their hot start, they're probably going to kick the crap out of the 3-12 Bears. It might be a new year, but it's the same, old, toothless Monsters of the Midway - tons of injuries, keys pieces not performing, regression of the young core, etc. Although, there have been a few bright spots (Jordan Howard, Leonard Floyd) that give hope to a brighter future; as of now, they're playing for draft pick status. But, with today being the last day of the football season for us Chicagoans, I figured now would be the best time to "show off" the latest additions to my Bears All-Time Roster Collection. Like the early days of this blog with the Cubs, a lot of names have floated on and off the roster this year (roster jenga, hence the title). 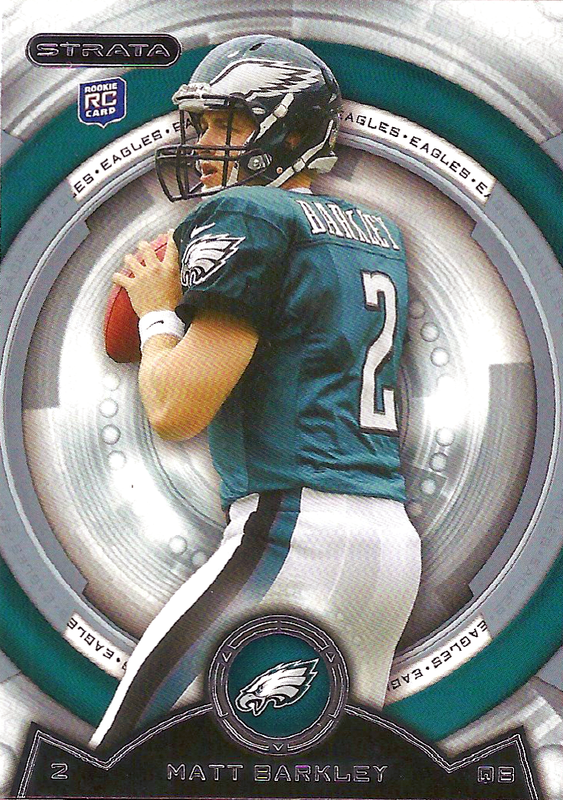 For instance, Matt Barkley was never supposed to see the field for the Bears. The former Eagles bust was signed by the Bears as extreme quarterback depth. Thanks to injuries to both maligned-starter Jay Cutler and back-up Brian Hoyer, Barkley has been at the helm for six games now. All things considered, he's been okay - posting a 75.2 rating - but he was never supposed to be a Bear. That said, he is, so I picked up this 2013 Strata single to represent the now-starter in my binder. The background reminds me of Sportscenter graphics; is that just me? Here's another guy who was never supposed to see game action for the Bears this year - Daniel Braverman. The noticeably shorter-than-average (5'10") wide receiver was drafted by Chicago in the seventh round this year, after not even being invited to the NFL combine. He was cut by the team after training camp, but he was inked to the practice squad, just in case. With 19 men on IR, as of this writing, it was almost inevitable that Danny would eventually get a shot. 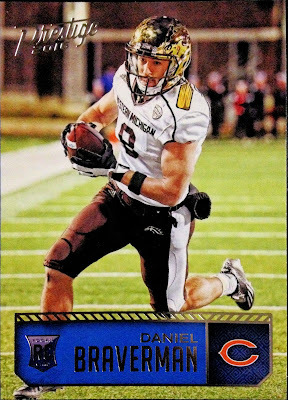 The Western Michigan alum made an appearance in the 2016 edition of Panini Prestige, in his Broncos duds. This set reminds me of a mid-90's Stadium Club release. What are your feelings on Panini's first exclusive year with the NFL? In contrast, Lamarr Houston has been with the Bears for several seasons now, signed as a free agent for the 2014 campaign. The outside linebacker has been a useful piece, if healthy... and that's a big if. 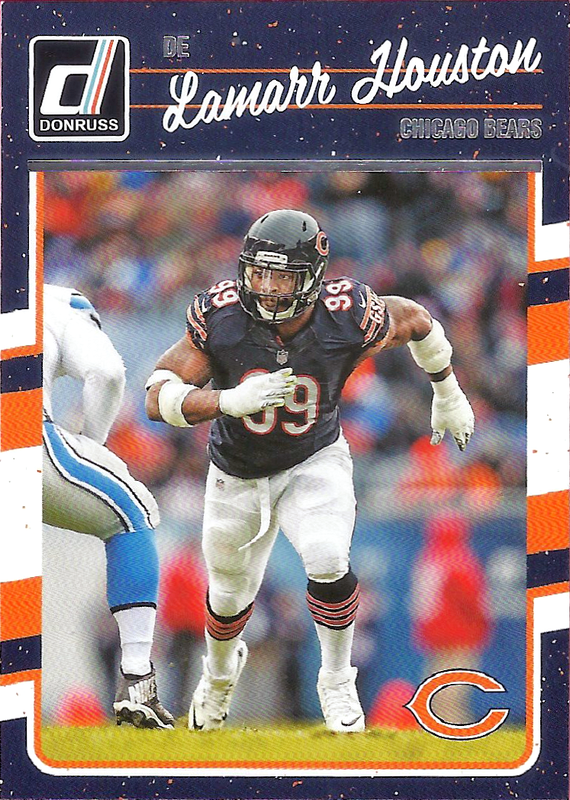 Unfortunately, he'll probably be best remembered as the guy who ended his season by tearing his ACL while celebrating his first sack of the season, in a game which the Bears were losing by 25 points, during that first year in the Windy City. This isn't my first card of Houston, but it is my first of him as a Bear. This '16 Donruss single will replace a '13 Topps card (with the Raiders) in my binder. In my opinion, Donruss looks much better as a football product than a baseball one. Probably because of the infusion of a lot of color. I have one final new addition to my Bears All-Time Roster Collection; however, this one is considerably older than those previously shown. In fact, I couldn't believe I didn't already have this "junk wax era," 1989 Score card, featuring Mark Green. 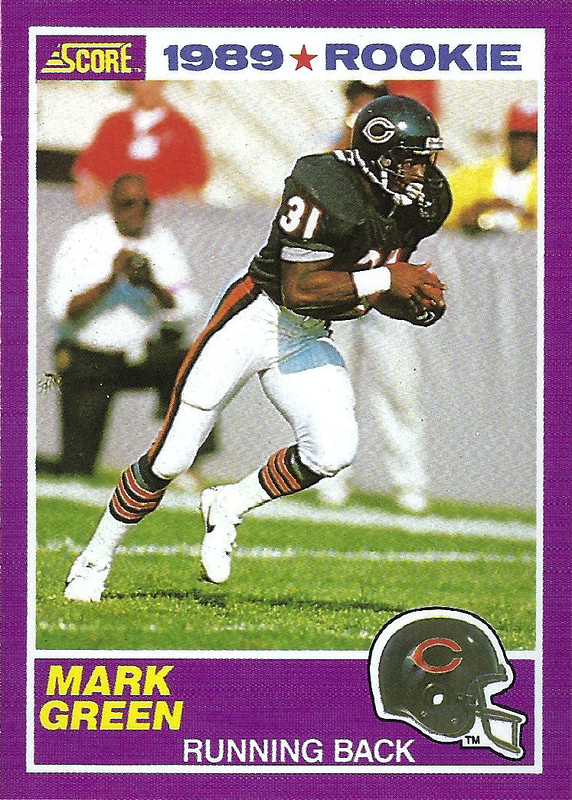 The back-up running back called the Second City home from 1989 through 1992 and I could have sworn I already had him represented in the binder. 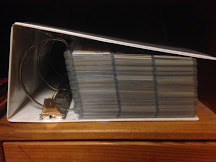 Maybe my new year's resolution should be to get more organized? Anyway, all of these cards came from a boredom induced trip to my LCS. Speaking of boredom, it's looking like the Bears are going to get blown out again (10-0 Minnesota in Q2), so perhaps I should find something else to do with my New Years Day. Yay for draft positioning!